1. Homemade ice cream – With an average November temperature in Beeville not far off 80 degrees, ice cream is most definitely still on the bill. Zebu are characterised by a fatty hump on their shoulders, a large dewlap, and sometimes drooping ears. They are well adapted to withstanding high temperatures, and are farmed throughout the tropical countries, both as pure zebu and as hybrids with taurine cattle, the other main type of domestic cattle. Zebu are used as draught and riding animals, dairy cattle, and beef cattle, as well as for byproducts such as hides and dung for fuel and manure. They come in other varieties as well, including mini-zebus which people keep as pets. 3. Coins – Coins are for sale on Day 1. This jumped out as unusual as it seems like more a collector’s or specialty item thing than something you’d see at an Amish auction. 4. 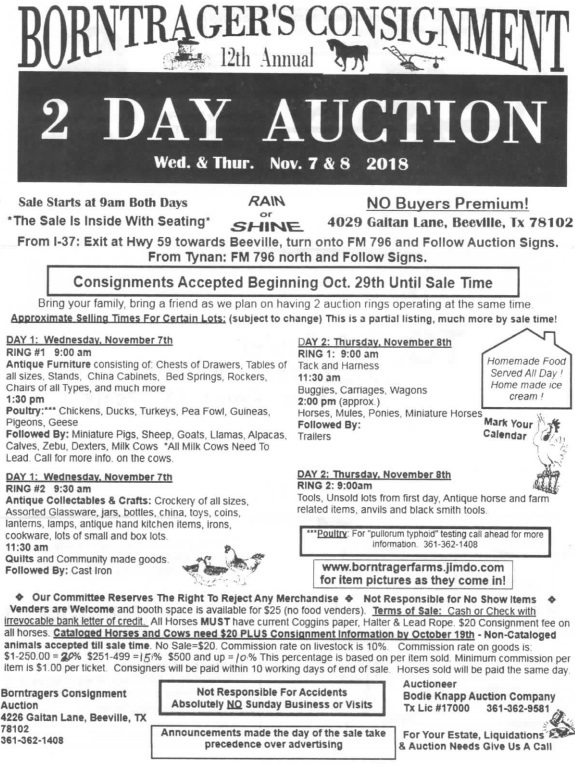 Two Auction Rings – The Beeville Amish community is a small one – an estimated 65 people, which may mean a dozen households, if that – but this auction is large enough to require two rings running simultaneously. 5. Poultry typhoid testing – You can call ahead for “pullorum typhoid” testing info for poultry. Sounds a bit ominous, but apparently not much of a public health threat. This poultry disease has essentially been eradicated in the US but regular testing is still recommended as a precaution. I guess especially if you are going to be mixing birds from a variety of sources as at an auction, you want to be careful. 6. Absolutely NO Sunday Business or Visits in bold at the bottom reminds us this is an Amish event. This annual auction helps to fund the local Amish school. You can see photos from a previous edition here. They do have a committee that reserves the right to turn away items they judge to be inappropriate and more modern items are assigned to the “back row” and are sold last. 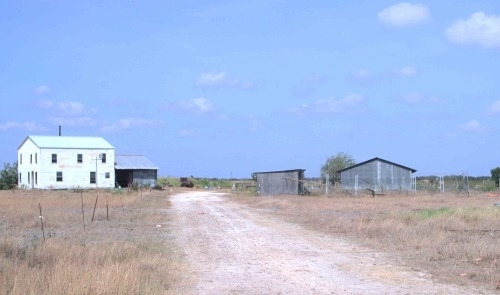 The sale is 85% inside a large metal barn with seating and open doors as there is no electricity in their community. A portion of the sale is held under a large tent and outside in the open. Food is available, vendors can rent a booth & children are welcome. I call this sale the best kept secret in Bee County. I’ve been friends with the members of the community for over a decade and help them with the auction every year; flyers, advertising and a small website kept for the auction – which we’ll be updating soon. 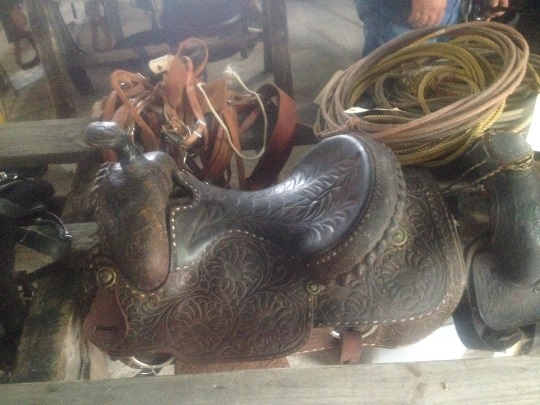 I help at the sale by working the floor during the auction and have certainly learned a lot about old items in general. I believe this is the website Pam mentions. RC, thanks for sharing. Neat to see the zebus in action and was also glad to be reminded of this community in Belize. The Noah Hoover Mennonites have some similarities to Old Order Amish. A college friend said he knew someone who had a pet zebu. The zebu got loose, ran off, joined a herd of deer, and the owner had to hire a single engine plane to find it and had it shot with a tranquilizer to get it back home again. I suspect he didn’t expect to spend that much money on an already expensive pet!